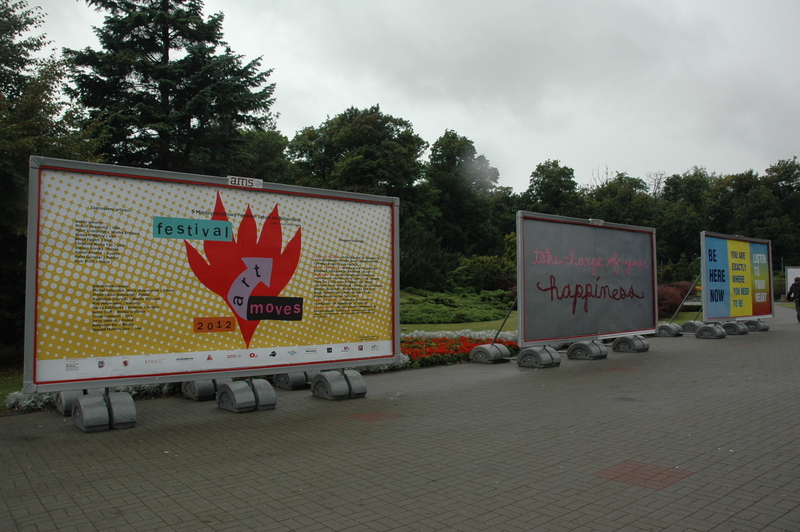 I had the great fortune to visit Poland for the Art Moves Festival, an annual exhibition of art on billboards, founded by artists Joanna Górska and Rafał Góralski (Galeria Rusz) in 2008. They invited me to present some of my ribbon texts on billboards and visit their fascinating city of Toruń. I’m so glad I accepted their invitation. My first trip to Poland could not have gone better. Artists’ presentations at Galeria Rusz’ studio. Galeria Rusz assembled a cadre of interesting international artists at various stages of their careers. I was very lucky to reconnect with Susan O’Malley, a fellow CCA alumna from California, and meet Alicia Eggert, a text-based artist based in Maine, whose work I’d admired on the web. I was also very happy to get to know Kevin Duff (UK), Egor Kraft and Karina Eibatova (Russia), Roy Meuwissen (Canada), Darya Zaichanka, Michał Leśniczak, and Maria Wawrzyniak. 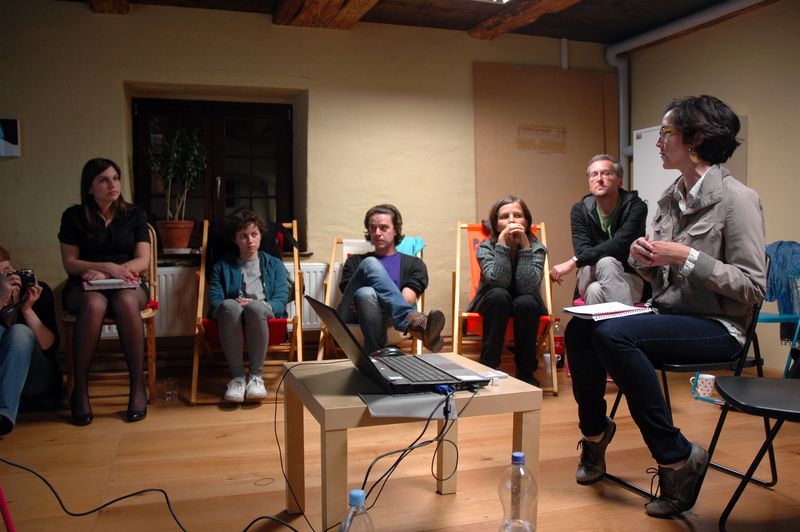 Joanna and Rafał are artists as well; they organized a night of informal artists’ presentations to familiarize each other with our practices, with an incredibly pleasant and whip-smart translator, Jagoda Ratajczak (nicknamed Blueberry). It was awesome to arrive in a new country and find simpatico with artists from such different backgrounds. With the wonderful help of Art Moves assistant Agnieszka and volunteer Anna, we explored the city together. With locals sharing their knowledge of Toruń and Polish language and culture, I found my experience very satisfying. Our three days were filled with so many experiences, it felt like weeks. Toruń is a beautiful, fascinating setting. Its features a massive city wall that runs along Poland’s largest river, the Vistula (Wisła). It’s also the birthplace of Nikolas Copernik, and the home of delicious gingerbread. Founded in the age of the Teutonic Knights, Toruń has preserved or reconstructed many historic buildings. I loved the mix of old and new signs, flags, and typography. We were incredibly impressed by the spacious, sophisticated Contemporary Art Centre. I loved Widomy kapitał, the exhibition by Agnieszka Kurant, a Polish conceptual artist. One of my favorite pieces of hers was a radio tower broadcasting the an audio track stitched together from the dramatic pauses in various political speeches. It was a great example of art that says so much with very little. She’s working on a forthcoming show at the Guggenheim—look out! We were also delighted to visit the medieval festival. I wanted very much to learn more about the participants in the swordplay competitions, who likely assembled or made their own costumes, armor and weaponry. Re-enacting medieval swordplay can seem very nerdy, but these competitors had meticulous costumes fitting for this magnificent gothic city. Even better, a few competitors aggressively made the most of the two-minute bouts; we could hear the “THWACK! !” of sword against shield in our rooms a hundred feet away in Dwór Mieszczański (Burghers’ Hall, the building in the background of the photo above). What is it like to be an artist in a gothic city? For Rafał and Joanna, it means having a studio inside the city walls—not within the city walls, but actually situated within a tower in of the wall. Their windows are tiny, just big enough, it seems, for a bowman to sight an invader. Now, though, one could use this space to stage a performance by a great Polish singer-songwriter folk duo called Twilite as an art opening, and to ply foreign artists with pierogis of all kinds, which would then fuel a spontaneous dance party. On the last day, we had a bonfire scheduled, but afternoon rains drenched the firewood and our hopes for flame-cooked kielbasas. We opted for a ferry ride on the Vistula, but the weather threatened wind and rain, driving away other sightseers, who were needed to achieve the minimum ticket count before the boat would leave the dock. When we tried to while away wait with beverages, the draught emitted only foam. The outlook was grim. Then, a reversal of fortune: the strictly-Polish-speaking captain, apparently the father of the two sailor-outfitted youths manning the ferry, jubilantly ushered Susan and I up to the bridge, where he started the engine and gestured for us to take the steering wheel. Though there were only our small party on the boat, we were off. The sun broke through the clouds for magnificent late afternoon views, and beverages aplenty soon appeared. We had accepted paying a few fabricated “we-don’t-speak-the-language” taxes here and there, but this ferry family seemed to offer us a “welcome-and-enjoy-Torun” rebate. A slogan for the city appeared on many tourist souvenirs: Toruń: Heart Beats Stronger. In my experience, I felt that Toruń was a place where my heart grew fonder—for artists like Joanna and Rafał, who spent all year planning an exhibition that inserts art in public spaces for everyday people, and generously sharing their wonderful historical city; and the artists from around the world who came to dialogue and make new friends. The Art Moves Festival continues through October 17. 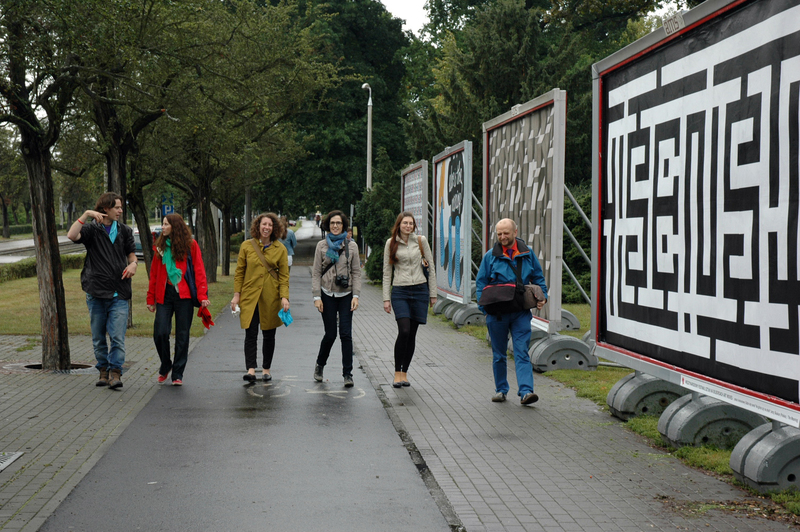 Stationary billboards are on view in Rapacki Square on Chopin Street; text and video works are also on view on LED screens on LED screens on Kraszewski Street, Szosa Chełminska/NOT, Czerwona Droga/ Jan Paweł II Avenue; and mobile billboards throughout Toruń. Thanks to Joanna, Rafał, Agnieszka, Anna, Susan, Alicia, and all the Art Moves artists; the kindness of strangers; Art Moves supporters (Minister of Culture and National Heritage, the Local Authorities of Kujawsko-Pomorskie Region and Toruń Municipality, AMS SA billboards, Plaza Toruń, STGU, CityCelebrity, AMS SA, Artysta.pl, Design Attack, Arteon, O.pl, cowtoruniu.pl, TVK Toruń, rynekisztuka.pl, Independent), AIG, HWT studio, and M.